I’ve recently come across some blog posts and some Boolean Strings discussions on LinkedIn that inspired me to go back and tinker with searching LinkedIn via Google and Bing. My first reaction when people are curious about the most effective ways of retrieving public LinkedIn profiles is to encourage them to experiment on their own first instead of looking for answers to copy and paste. Quite literally 99% of everything I know about sourcing (and recruiting!) I learned through being curious and experimenting. People learn by doing, and more specifically by failing/struggling, and not by copying and pasting somebody else’s work. It’s also important to realize that you cannot and should not implicitly trust sourcing advice (or custom search engines) you find online or in training sessions/materials – there is never only one way of doing anything, and the CSE’s you use and the syntax you copy and paste may in fact artificially limit search results and prevent you from finding the best people. So my advice is to take other people’s work (including mine!) and experiment. 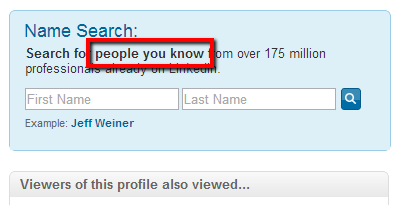 I saw someone use “people you know” in their LinkedIn X-Ray search, presumably to target and isolate LinkedIn profiles and eliminate false positive non-profile results. 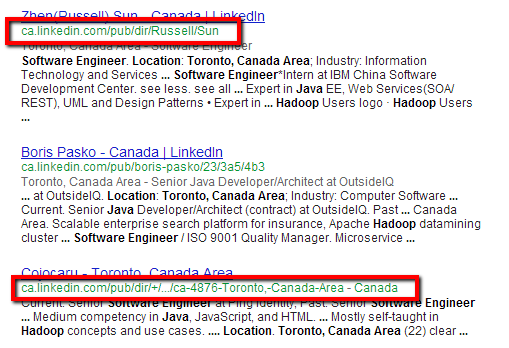 If you didn’t already know why someone would use such a phrase, it’s because it’s a fairly unique phrase found on public LinkedIn profiles, and it appears to be indexed by search engines like Google, so you can search for the phrase to find LinkedIn profiles without having to use things like (inurl:pub | inurl:in) to return profiles, or -dir, -jobs, etc., to prevent non-profile results from being returned. It does a decent job of isolating profile results, to the point where inurl:pub, inurl:in, -dir, -jobs (or any similar techniques) simply aren’t necessary. But of course the next thing I did was wonder what other phrases would work. All you need to do is look around a public LinkedIn profile and look at other words and phrases that seem unique to profile results and would not commonly be mentioned elsewhere on someone’s LinkedIn profile and experiment by including them in your searches and inspecting the results. Now, I haven’t tested all of those and the others I didn’t even bother listing, but I did test a few. Don’t be fooled by the variance in Google’s estimate of results (763 to 1,220), which are different for each search. Scroll to the bottom of the results for each search and you will see all of them only have 2 pages of results, and the actual number of results being returned ranging from 13 to 15 (13 being the most common). I will leave it up to you to compare the differences, if any, between the search results. 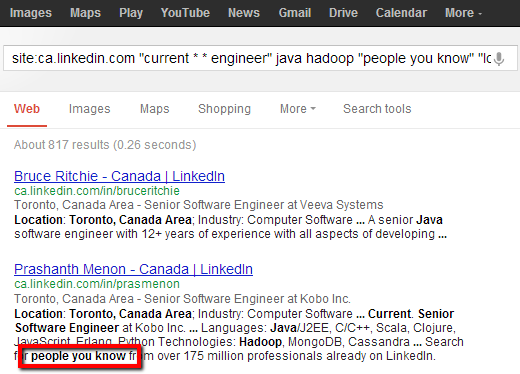 So, can anyone tell me why sourcers and recruiters tend to act like Google is the only way to X-Ray search LinkedIn? As I have written many times before, Bing typically does a better job of more “cleanly” retrieving results from LinkedIn, specifically profile results, without the need to use any additional terms in queries to try and isolate profiles from non-profile results as you are required to do in Google. Now let’s compare a Google search with a Bing search. We’ll use the exact same search terms, except with Google, we’ll use a term to isolate profiles, and with Bing, we won’t use any profile isolating terms. I use Google all the time, but I’m not such a Google fanboi that I don’t and can’t recognize the fact that other search engines can be superior for specific uses. When it comes to searching for LinkedIn profiles, the bottom line is that Bing is and cleaner and more efficient than Google because you don’t need to add ANY additional terms to isolate profile results and eliminate false positive, non-profile results. Look Ma – No Site: Search Operator! 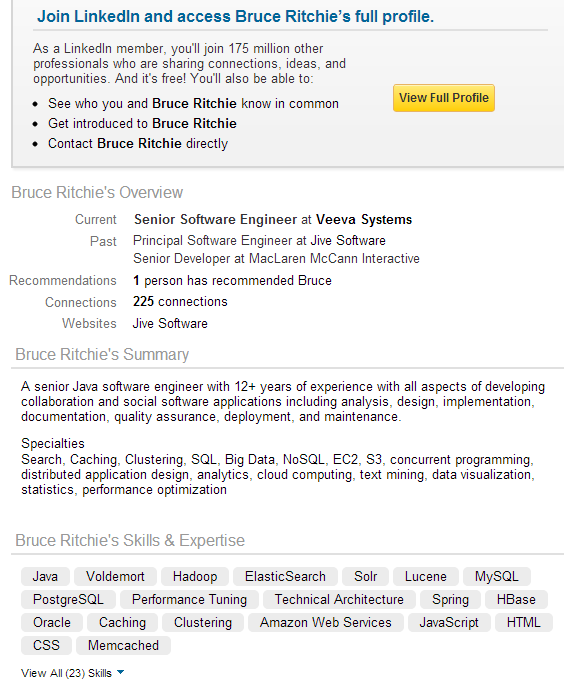 Have you ever wondered if you can use an Internet search engine to search for LinkedIn profiles without “X-Ray” searching using the site: command? Now, there’s more than one very interesting element to that search (and the results!) that I hope you notice, but for the sake of this post, I’d like to call specific attention to the fact that it returns LinkedIn profiles without using the site: search operator, so it isn’t an “X-Ray” search. When I am looking to find LinkedIn profiles, I start searching LinkedIn using LinkedIn’s search interface 100% of the time. With its structured fields and facets, LinkedIn’s search interface is more powerful, configurable, and precise and gives you much more control over your ability to retrieve exactly what you need than any Internet search engine. Period. If you’re trying to search an area that spans across states, metro areas, and countries, you can easily do so with more precision using LinkedIn’s postal code radius search, which crosses borders. While you can try to search by current titles and companies using Google’s asterisk or Bing’s NEAR:X (e.g., “current * software engineer”), irrefutably, you can more easily, precisely, and inclusively do so using LinkedIn’s current title and current company fields. Using an Internet search engine to search for public LinkedIn profiles is intrinsically challenging because you’re using something other than the native search engine to search the site. Also, keep in mind that LinkedIn can make changes at any time that affect what is searchable and retrievable via Internet search engines. 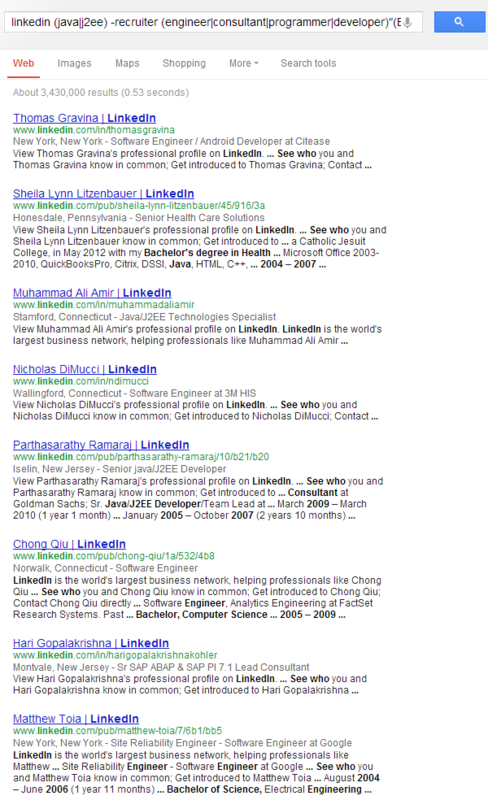 What works well today for Google and Bing may not work well tomorrow, but LinkedIn’s advanced search will always work. Since 2005, I’ve taken the time to significantly and strategically build my LinkedIn network so that a great number of people show up in my search results within my network – specifically my 1st and 2nd degree. The only time I really X-Ray search LinkedIn (other than tinkering around) is to find the specific public profiles of LinkedIn search results who are beyond my 2nd degree network. There are many quick methods of allowing you to view the public profile of a person who is your 3rd degree or group connection – or completely beyond your network, for that matter. Ultimately, I have found that the return on time invested when searching LinkedIn is higher when you start with LinkedIn and use Internet search engines to find the profiles of specific people beyond your 2nd degree network, as opposed to starting a search with an Internet search engine to X-Ray LinkedIn to identify people. If you haven’t invested time in strategically and methodically building your LinkedIn network so that you’re pleased with your search results, you should. 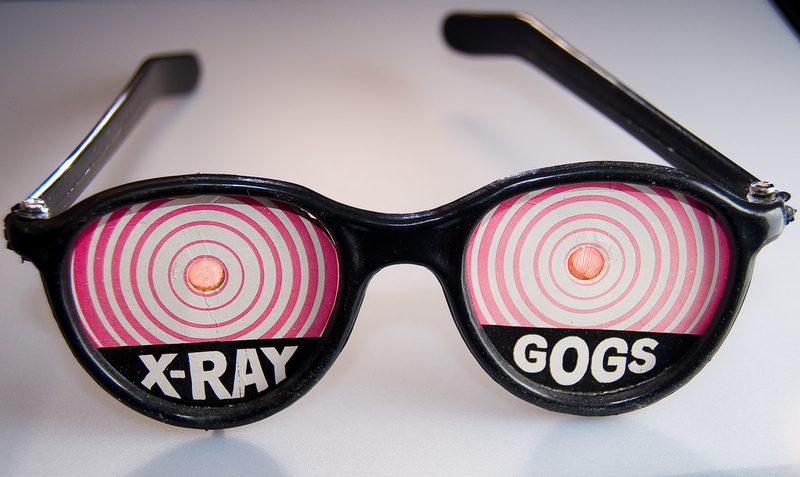 So, what’s the most effective way to X-Ray search LinkedIn? There is no single most effective way to search LinkedIn via Internet search engines – there are many different ways, as I have demonstrated a few using both Google and Bing. Please don’t simply copy and paste search strings and syntax you see in blog posts and in LinkedIn group discussions without testing them yourself, and ideally making changes and experimenting and observing results for variances. This will give you insight as to why and how the searches work or don’t work to your liking. You don’t learn anything from copying searches and running them without thinking. Who knows – with a little curious experimentation, you might just come up with the next interesting discovery to share with the global sourcing community!